The titular puppet, alongside Christiani Pitts, in King Kong. Photo by Joan Marcus. BOTTOM LINE: King Kong is both an engrossing story about authentic relationships and a Broadway spectacle with impressive special effects. 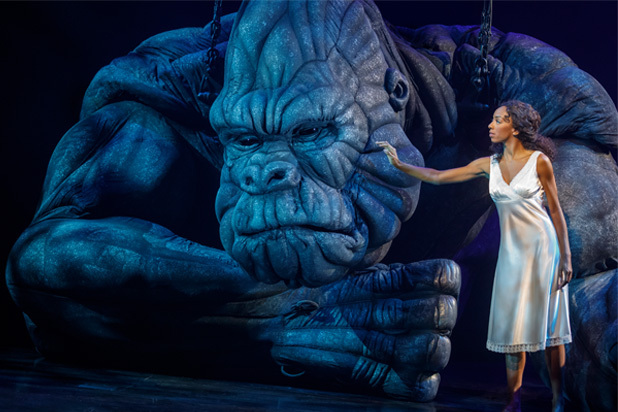 King Kong, the new Broadway musical of Australian origin, is not your average high-tech show. Even if you are familiar with this story (beyond the classic 1933 film, recent remakes have appeared in 2005 and 2017) you will probably connect to it in a new way when you see starlet Ann Darrow (Christiani Pitts) singing onstage to a twenty-foot, two-ton gorilla beneath a full moon. Against Peter England’s floor-to-ceiling projections, the story unfolds on snowy streets within the Art Deco metropolis of New York. Ann Darrow is a young, struggling actress, newly arrived in the city, who is soon reduced to warming herself at different restaurants until she is kicked out. Fortunately for her, or so it seems, she meets the snazzily dressed producer Carl Denham (Eric William Morris), who invites her to star in in his next film. The two connect as outsiders who are both searching for a “sense of wonder,” a theme that will recur throughout the show. Indeed, wondrous things happen from then on, despite the proverbial warning that it is bad luck to let a dame on your boat. Ann and Denham board a ship run by Len (Erik Lochtefeld), nicknamed “Lumpy” by the rest of the crew. Clearly the kindest person on board, Ann's moderating influence allows the ship to arrive safely on Skull Island, a place of thick undergrowth and dangerous snakes. While the cameras roll and Ann is screaming on cue, she is grabbed by an enormous hand and lifted into the jungle. As voiced by Jon Hoche, the great Kong roars to make his presence known. The famous gorilla is moved by various cables and by no less than ten black-clad operators and three offstage "voodoo operators." Since the only comparable experience is being on a ride at Universal Studios, I must say I liked meeting King Kong in a Broadway setting. Getting to know him up close, rather than zipping past him on a ride, allows us the chance to stare into his enormous, responsive eyes, making clear the production’s goal of showing us how to be ourselves, and how to be kind. Kong rescues Ann from a beautifully lethal snake creature and feeds her sips of water from his dirty paws. They seem to be doing just fine until Denham and his film crew show up with their sleeping gas to transport the happy couple back to New York, where exhibiting the “monster” onstage seems to be the most lucrative option. Although you probably think you know how it all ends, this King Kong adds some interesting tweaks, ones that are very empowering to Ann. And the special effects around the ending are breathtaking. As thrilling as it is to see King Kong live on Broadway, this production also offers certain things the various films do not. For one thing, this version has much less cultural baggage than previous incarnations. There are no "savage" tribes on Skull Island, nor is there the implicit racism in the Kong-Ann dynamic (perhaps helped by casting Ann as a strong Black actress). Christiani Pitts has such optimism and self-confidence that she is beloved of men and beasts. And her persistence in communicating with Kong—and escaping with him—is something I wasn’t expecting to see and am glad I did. As Denham, Eric William Morris convinces you he’s a nice guy, even if he isn’t. His slick character seems to embody all that's wrong with show business, something that's especially poignant in the age of #MeToo. Roger Kirk’s loud costumes are very much of the 1930s and bring notes of the Jazz Age to the production. Drew McOnie's choreography makes everything from an audition to a boat trip into a high-energy spectacle. Eddie Perfect has some real show-stopping songs, such as “Queen of New York,” “Scream for the Money,” and “The Wonder.” Overall, this King Kong is a big step forward for empathy, for women’s empowerment, and for technical accomplishments in puppetry. King Kong is by Jack Thorne (Book), Marius De Vries (Score), and Eddie Perfect (Songs). Directed and Choreographed by Drew McOnie. Scenic and Projection Design by Peter England. Costume Design by Roger Kirk. Lighting Design by Peter Mumsford. Sound Design by Peter Hylenski. Creature Design by Sonny Tilders. Kong/Aerial Movement Director is Gavin Robins. Hair Design by Tom Watson. Orchestrations by Chris Jahnke. Stage Manager is Kathleen E. Purvis. The cast is Christiani Pitts, Eric William Morris, Erik Lochtefeld, Ashley Andrews, Mike Baerga, Rhaamell Burke-Missouri, Chloë Campbell, Leroy Church, Peter Chursin, Jōvan Dansberry, Kayla Davion, Rory Donovan, Casey Garvin, Christopher Hampton Grant, Jon Hoche, Gabriel Hyman, Harley Jay, James T. Lane, Marty Lawson, Jonathan Christopher MacMillan, Danny Miller, Brittany Marcell Monachino, Jennifer Noble, Kristen Faith Oei, Eliza Ohman, Roberto Olvera, Jaquez André Sims, Khadija Tariyan, Jena VanElslander, Scott Weber, Jacob Williams, Lauren Yalango-Grant, Warren Yang, and David Yijae.